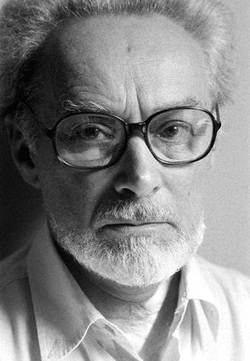 Primo Levi is a special case. He is not simply a great 20th-century writer, like Proust or Joyce or Eliot, who have all been deeply and repeatedly explored. Levi was an Italian Jew, born in Turin in 1919, and deported to Auschwitz in 1943, at the age of 24. When he emerged, he wrote one of the greatest documents we have about that horror, If This Is A Man. In it he showed us that there is something even worse than physical murder: the destruction of the victims' humanity and dignity which preceded it. At the same time, he showed us that it was possible to retain that humanity, even in Auschwitz. The villains of If This Is A Man are not murderers, but those who treat people like things, such as Alex the Kapo, who wiped his hand on Levi's shoulder as though he were a rag. And the heroes of If This Is A Man are men such as Lorenzo, the Italian civilian worker who saved Levi's life, at daily risk to his own; and Levi himself, who tells the story with justice and dispassion, transforming extreme suffering into knowledge and understanding.